Analyze and construct the Event-Flow Graph model. 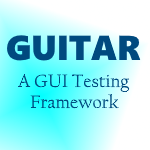 Java: Machines running GUITAR should have 'Java Runtime Environment (JRE)' version 6 or later. Bash: Machines should have a bash shell available. The bash shell is included by default on *nix machines, such as Mac, Ubuntu, Fedora Core, Redhat, etc. Windows users should install Cygwin in order to obtain a bash shell for running GUITAR scripts.